Among the white walls, some gray details and fascinating vintage wood furniture and doors of the apartment, is an elegant red chair decorating the space. 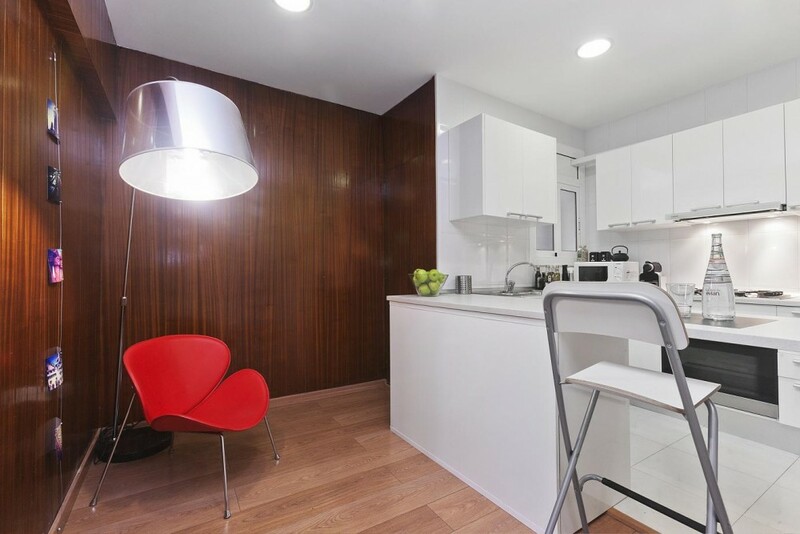 Recently renovated and fully equipped, is the ideal place to stay while on vacation in Barcelona, ? ?a few meters away from the Arc de Triomphe, the Borne district and the Sagrada Familia. 1 double bedroom with a bed of 1.5 m and an en suite bathroom, 1 double bedroom with a bed of a square and a half, a double room with two 90cm beds, two bathrooms (one in a room with bath and one with shower), fully equipped kitchen (with washing machine, refrigerator, microwave, coffee maker, kettle, toaster). This is everything that makes up the apartment, but also has a lounge with a sofa, TV with USB port for your music and your movies, a phone to receive calls and to make domestic calls within Spain (also be called by any thing that you may need). A spacious and elegant apartment with all amenities and close to all the places you can not miss of the Catalan capital.